What’s funny is that 15 years ago, I was studying happiness in philosophy class (and there’s not so many of them who cared about it). And 15 years after, I would just remember that happiness is some sort of choice, even if you’re not necessarily aware of it. But maybe you should be. 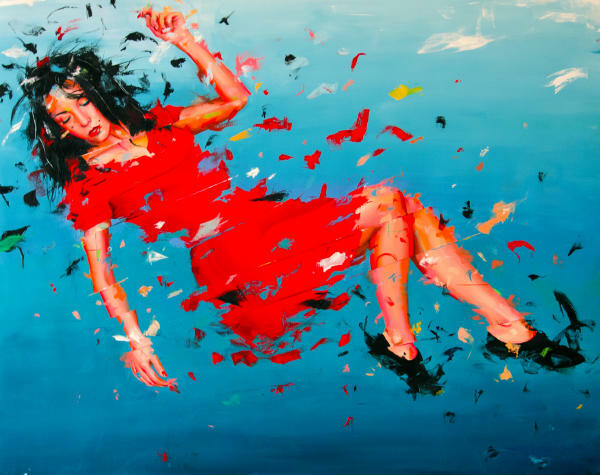 So, when you actually look at the canvas… Is this girl flying, falling, levitating? It’s not so obvious, or maybe it is… it’s a matter of point of view, it’s your call. And it’s really not about seeing the glass half full or not, it’s just a general feeling.